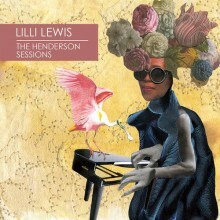 Award-winning jazz rock singer Lilli Lewis has released her debut solo album, The Henderson Sessions. Currently residing in New Orleans, Lewis is a singer-songwriter who has been playing the piano since the age of three, and is currently the lead vocalist for Kirk Joseph’s Backyard Groove (Joseph is a founding member of the renown Dirty Dozen Brass Band). Lewis’s new project includes nine acoustic songs featuring her soulful vocals against the backdrop of a stripped piano accompaniment, allowing her natural talent to shine. After a successful career performing as a soloist in New Orleans and with her acoustic soul orchestra, The Lilli Lewis Project, Lewis’s solo debut is filled with emotionally-charged tracks. The Henderson Sessions is a wonderful introduction to her raw vocal talent while simultaneously making hard-hitting social and political statements.